While we know I’m not a huge fan of cakes without icing if you’re going to serve a naked wedding cake it might as well look gorgeous too. 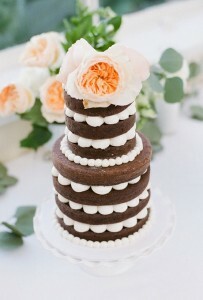 And the scalloped icing makes this cake elegant and very pretty! While the cake would look nice with icing in between the tiers the scallop design really pops. It just adds a glamorous look to the cake. Add a bright red flower to the top and you’ll have a practically perfect wedding cake. You can find this cake here. It was created by Enjoy Cupcakes.